Do NOT use the brush to clean the keyboard! An old workmate used to start his workday by drinking a mug of coffee and reading the newspaper; on the toilet. He was also a tad casual about hand washing, tooth brushing, bathing, grooming and most other socially sanitary practices. So things went rapidly downhill when I learned it was my newspaper he was reading in the toilet. “What’s the harm?” he shrugged when I caught him red (and dirty) handed. Through gritted teeth I calmly explained that it wasn’t very hygienic, and that harm could come in the form of gastro and vomiting for me, and facial bruising to him if I found him touching my newspaper again. All of us have encountered public toilets that look like the scene of some pre-historic disaster. Dunnies like this don’t just harbour germs, they supersize them. So you can imagine how delighted I was to discover that it’s quite common nowadays for people to fiddle with their gadgets in the toilet i.e. : phones and tablets. During a recent phone call, I commented on some odd background noises and was calmly informed, between grunts, that the other end of the conversation was taking place in the ‘Throne Room’. People! 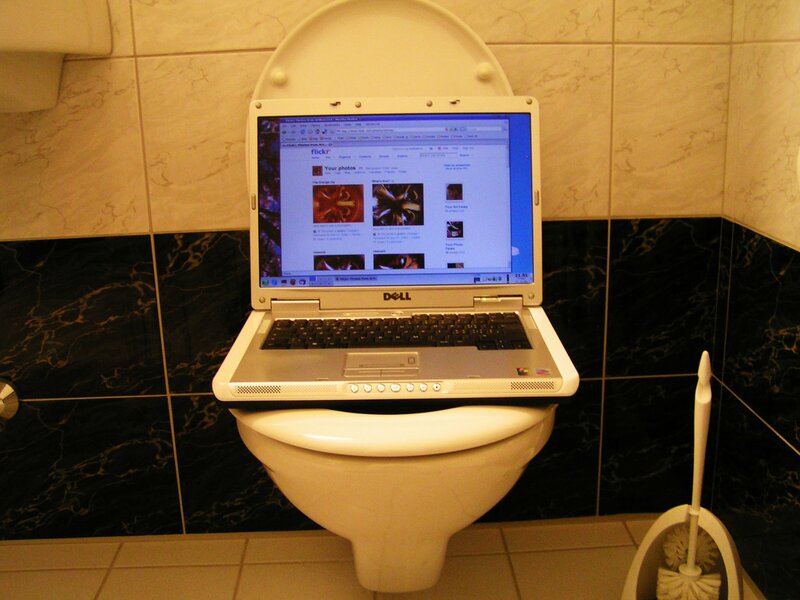 The toilet is not the place to catch up on phone calls, read your tablet, drink coffee, or enjoy any other food related activities! No. It is a place to relax and reflect while mentally correcting the graffiti. Thoroughly washing your hands afterwards will not clean the germs off your portable petri dish. Trust me, there is more than one way to ‘Go Viral’. Plus, ‘Status Update’ is one term that should never be linked to any toilet related activities. Look, I can’t stop people from doodling on their doodads in the dunny, but I’ll try to keep their dirty digits off my device; and coffee mug. This entry was posted in On a Lighter Note... and tagged Device, Phone Camera, Toilet. Bookmark the permalink.